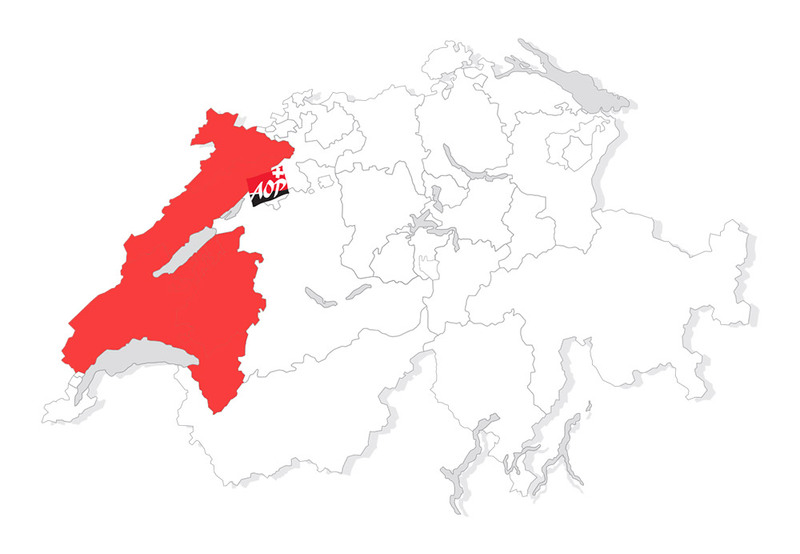 This is the first article in our “know your cheese” series, and what else to start with than our favourite dairy queen: Le Gruyère AOP? 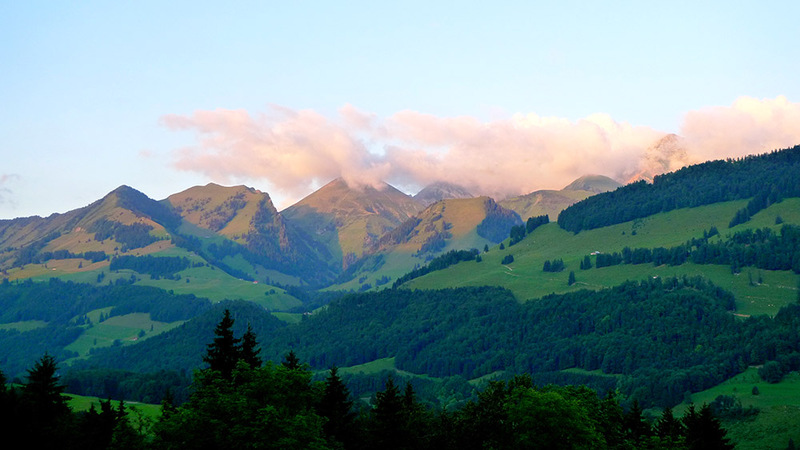 We have written this article after discovering the wonderful Gruyère d’Alpage website, who kindly let us use their pictures in this article and share the story of this fabulous product. 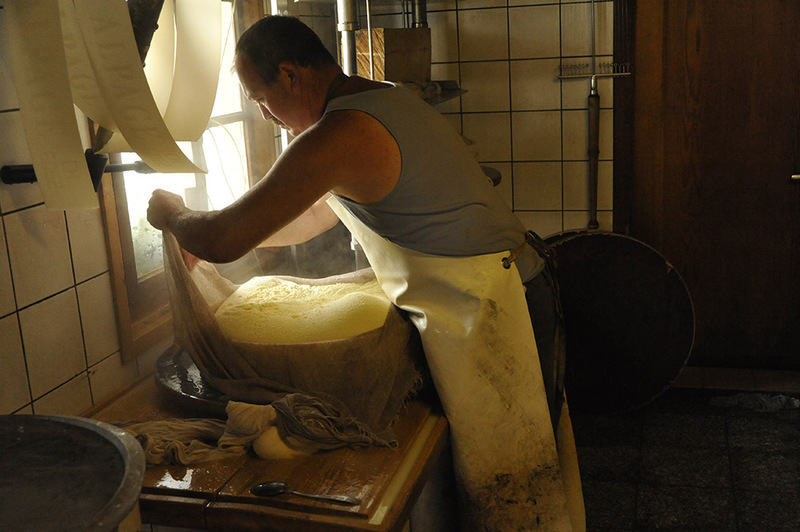 Although this article is about Gruyère AOP, the images below illustrate the “making of” Gruyère d’Alpage AOP, which is a more artisanal version made only in the summer months (May to October) in the high pastures of the Swiss Alps. Let’s put it bluntly, the kerosene-tasting, astroturf-textured leather soles sold in the US under the generic term “Swiss” has absolutely nothing to do with Switzerland (or with cheese for that matter). There is no cheese called “Swiss” in Switzerland, because there are hundreds of different cheeses and each one has a different name, texture, flavour, and story. The stereotype associated with Swiss cheese is the sweet-tasting “Emmentaler” (which we’ll cover in one of our next episodes). Best quality Gruyère doesn’t have holes. None, not even the tiniest one. Emmental does have big lovely holes in it, and has a sweet taste and nutty flavour, while Gruyère is much saltier and pungent. Just like you cannot make Bordeaux Wine in Chile. Wisconsin cheese is fantastic and so is the wine in Chile, but these are different things at their core. 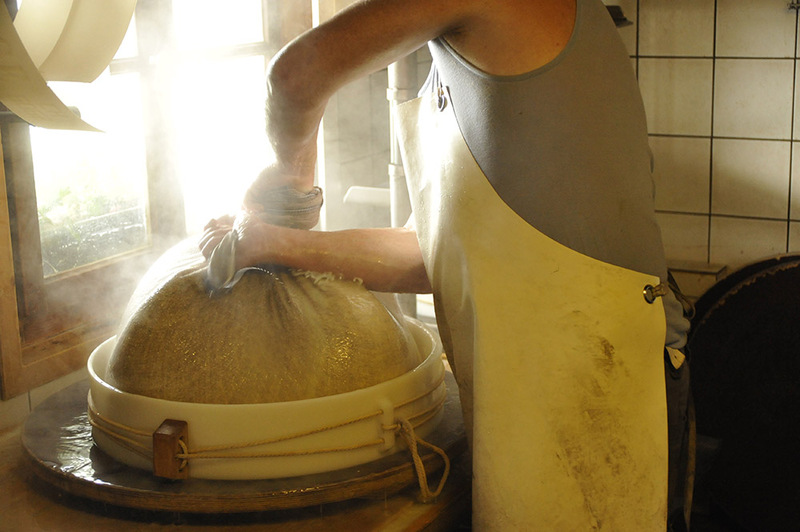 Because the terroir is fundamentally different, the final product will also be different even if the fabrication process is rigorously identical. Quality and great taste is what best describes this famous Swiss cheese, be it in its mild, semi-salty, salty or prime quality version. 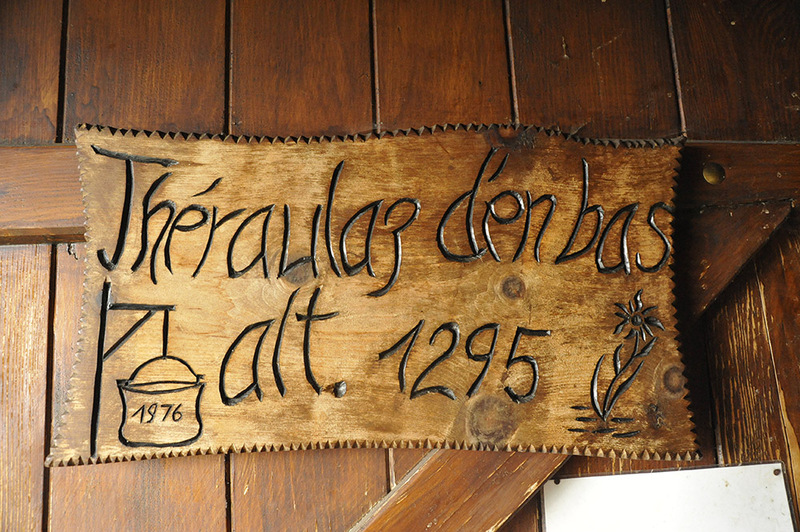 With a long-lasting tradition dating back to 1655, it is named after the town of Gruyères, in the canton of Fribourg. The origin of this cheese and its terroir was formally acknowledged in 1926 at an International Dairy Congress in Paris, when a resolution was adopted, saying that the names of cheeses derived from their places of origin (beside Gruyère, known ones are Emmental, Parmesan, Roquefort, Camembert) may only be used for goods produced in those areas. 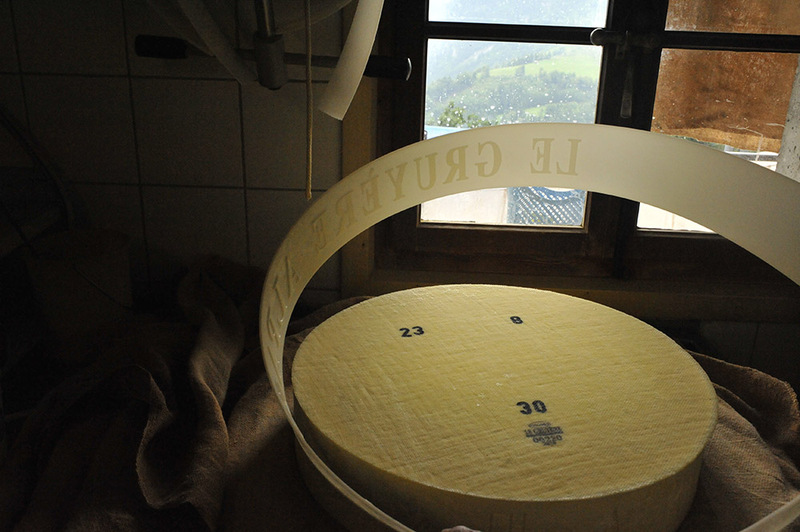 The label of excellence and first-class quality of products crafted only in certain regions is nowadays recognized under the Appellation d’Origine Contrôlée (or AOC) status, which the Gruyère cheese received in 2001. If you are wondering what actually makes this specialty inimitable in taste, well one of the secrets is the highest quality of the raw milk. 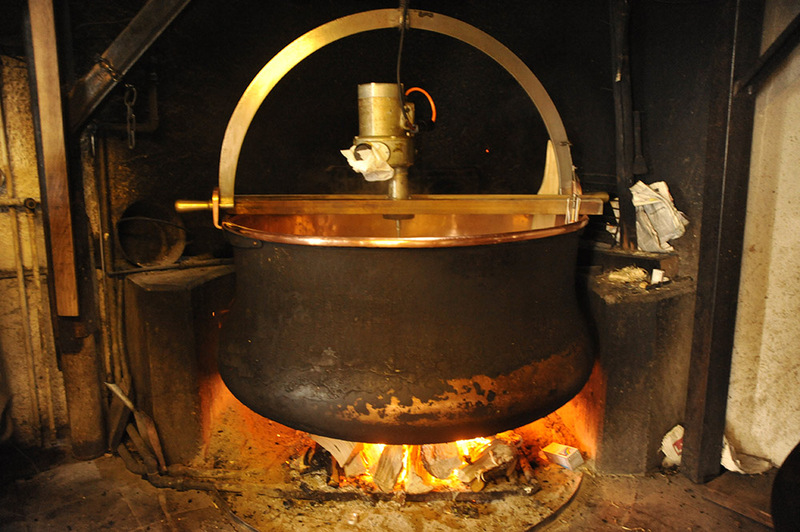 The milk undergoes no thermic treatment until its turned into cheese. 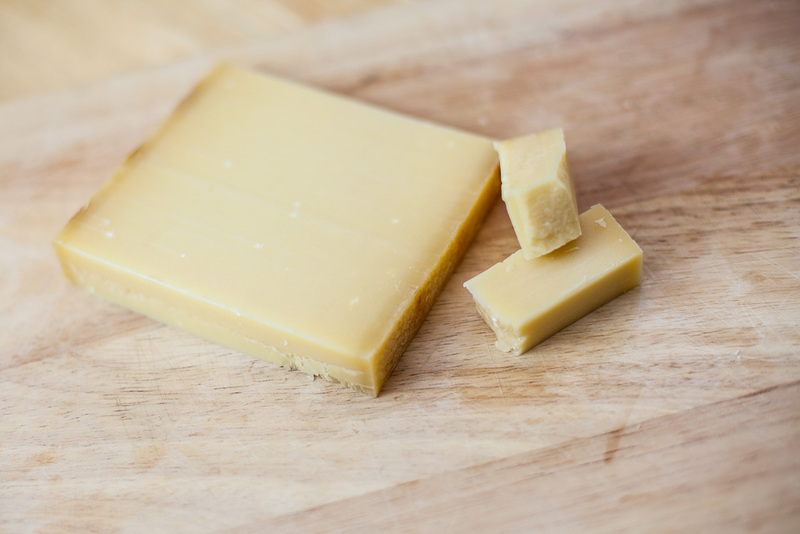 That’s right, real Gruyère AOP is made with raw milk which guarantees the preservation of the bacterial flora that gives the cheese its typical taste. 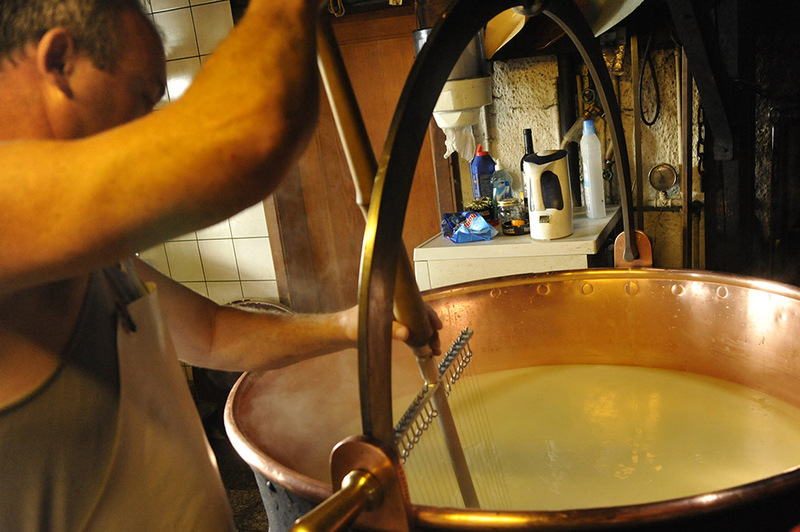 After leaving the fresh milking overnight, cultures are added to maturate the milk. 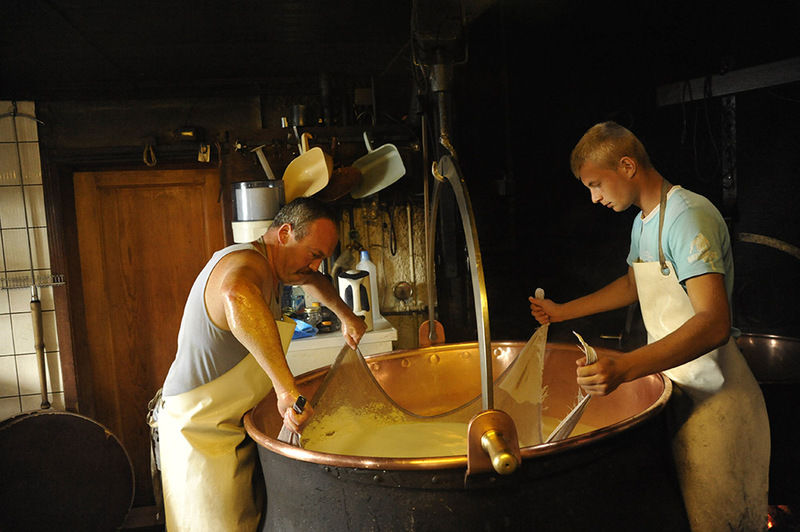 These cultures are whey-based lacto-fermentations and usually cultivated at the cheese dairy itself. After the maturation, rennet is added to curdle the milk. Rennet is a natural ingredient that comes from the stomachs of milk-fed calves and contains enzymes that cause the coagulation process. 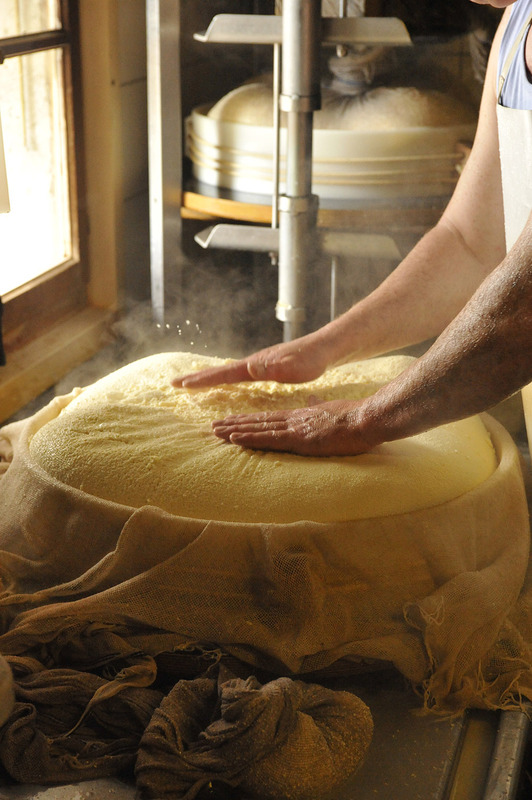 The combination of milk and lactic cultures is a living thing, therefore the knowledge and experience of cheese maker, the crafter, is fundamental! Mixing these ingredients must be done at the right temperature and time, one minute more can compromise the quality of the final product. 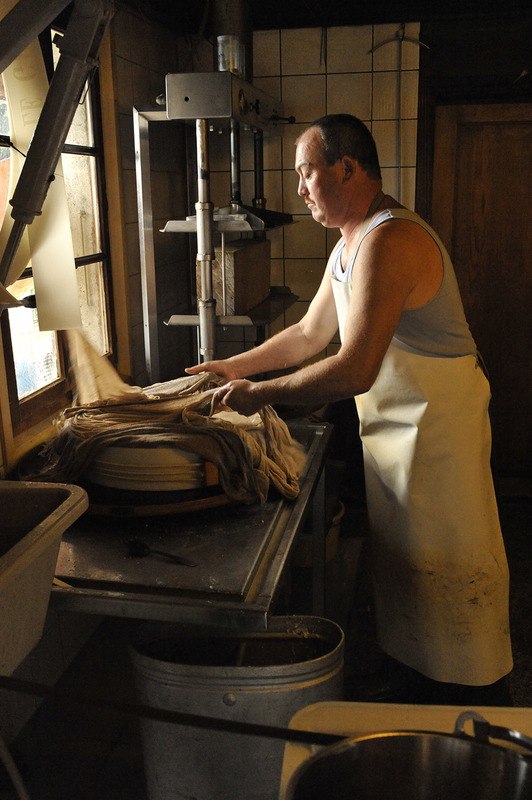 The following steps involve separating the whey from solid matters which will be pressed into a mould which becomes the cheese wheel (“meule” in French). And the whey is most likely used to make Rivella, the Swiss national soft drink :) ! 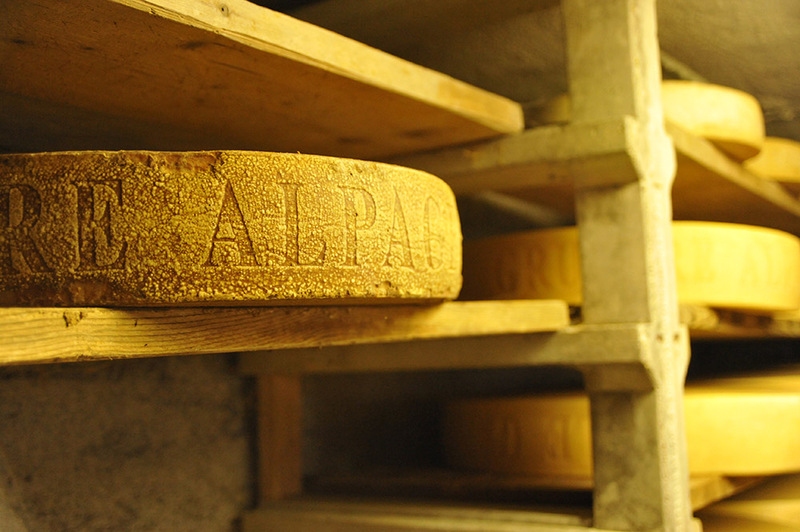 The maturation process comes in and the cheese wheels are stored for about three months in special climatized cellars, where is systematically washed with salty water. And if you thought that’s it, I can now enjoy a piece of this fine cheese, you’ll have to hold on for a few more months. Why? 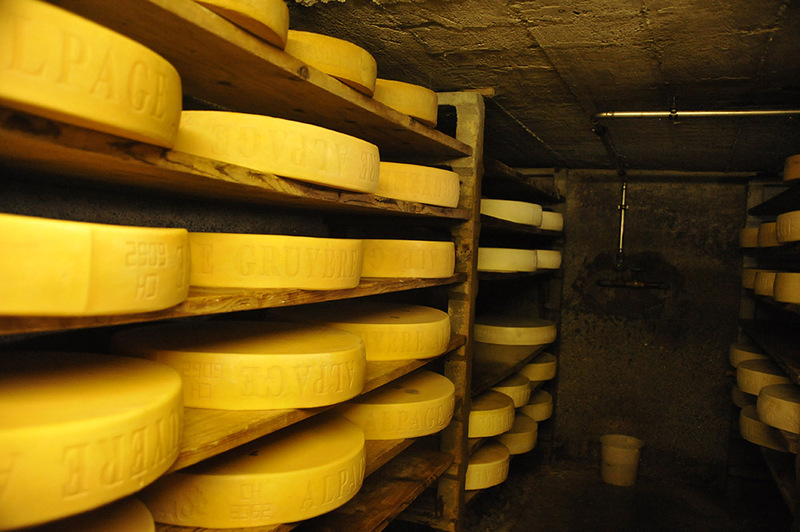 To complete the maturation and acquire the full flavour that makes it unique, several more months are necessary, period when the cheese is kept in “finishing houses”. 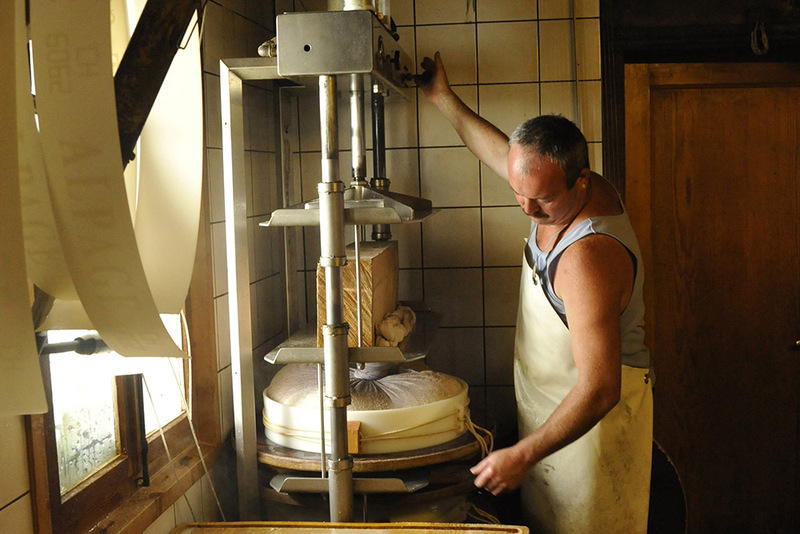 Altogether it takes five months for mild Gruyère, eight months for semi-salty, about ten months for the salty variety and at least twelve months for prime-quality Gruyère. This is a 100% natural product, produced from raw milk without any preservatives, or other nasty chemical substances. 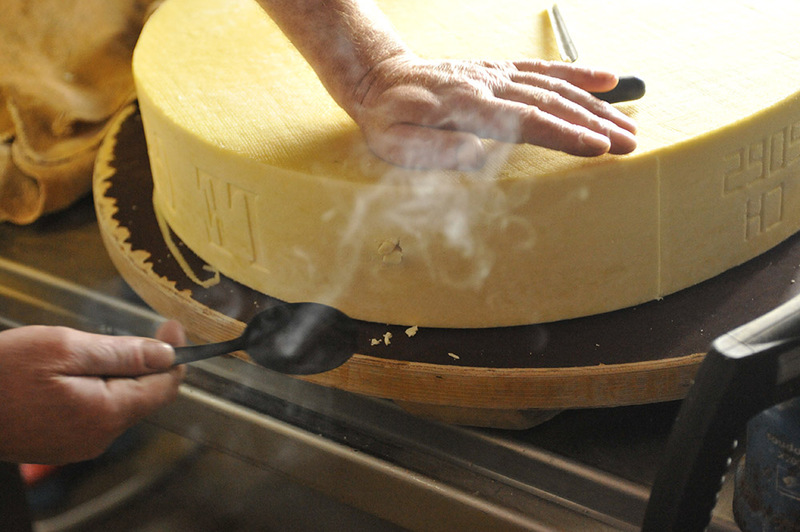 The quality of Gruyère AOC can be attributed to its unique recipe, the quality of the raw milk and the expertise of the milk producers, the cheese-maker and the maturer. 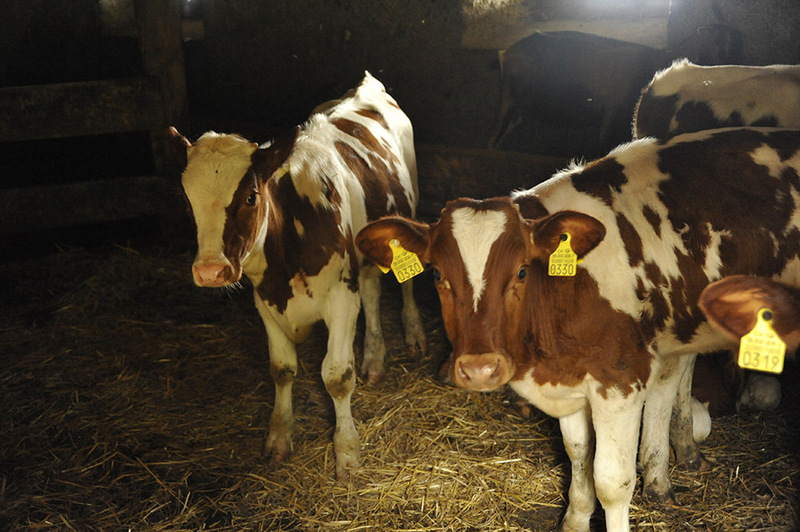 The raw milk comes exclusively from happy cows that are mainly grass fed. 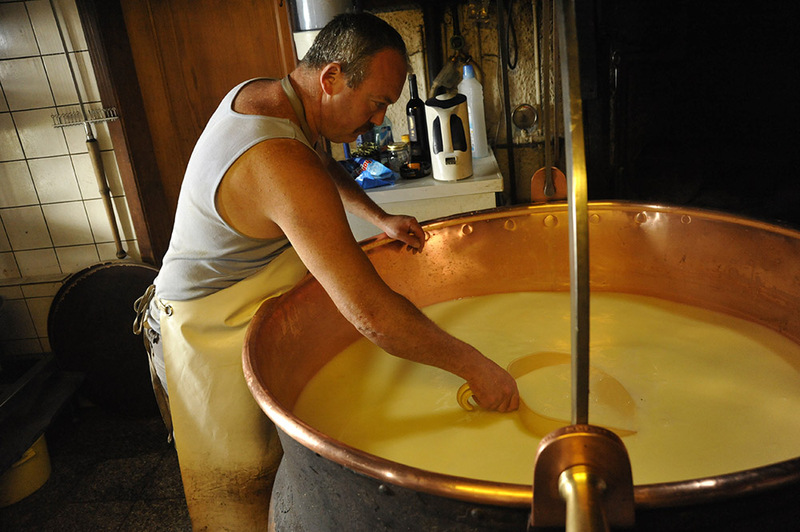 An impressive 12 litres of fresh milk are needed to produce 1kg of Gruyère, and more than 400 litres go into a single wheel!